Finally, Google Voice on an ATA is Here !! List of good VOIP providers. Nettalk duo still good deal ? Has anyone sorted through all this garbage? How do I Port my Number- I live in Canada!! Just hooked up my obi 202 !!! What are all you hep cats using for VOIP? Bulk SMS to USA mobiles! Dan Borislow wife having a good time!!! OBI 202 is here ! 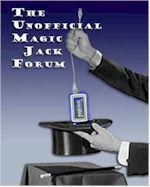 anyone need to contact the CEO of Magic Jack?